To be fair, I would imagine the restaurant gets a lot more crowded in the evening, as we heard many people telephoning to make reservations. Note also that they didn’t have an alcohol license at the time of our visit, but the owner invited us to shop at the liquor store around the corner. So this can be a go-to place for affordable “lively” dinners! 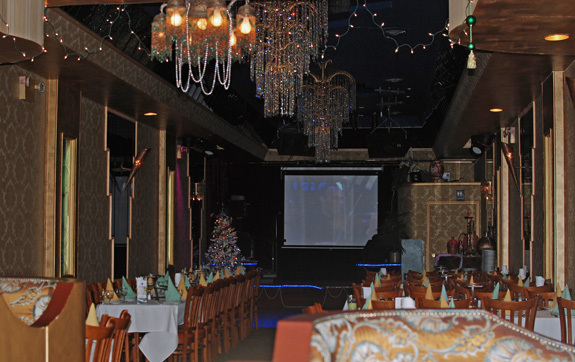 The menu mixes Azeri specialties with Russian standards and a selection of seafood dishes that seems to be common in the local Soviet restaurants, probably because, technically, we live by the sea − there are even fishing charters in Sheepshead Bay. 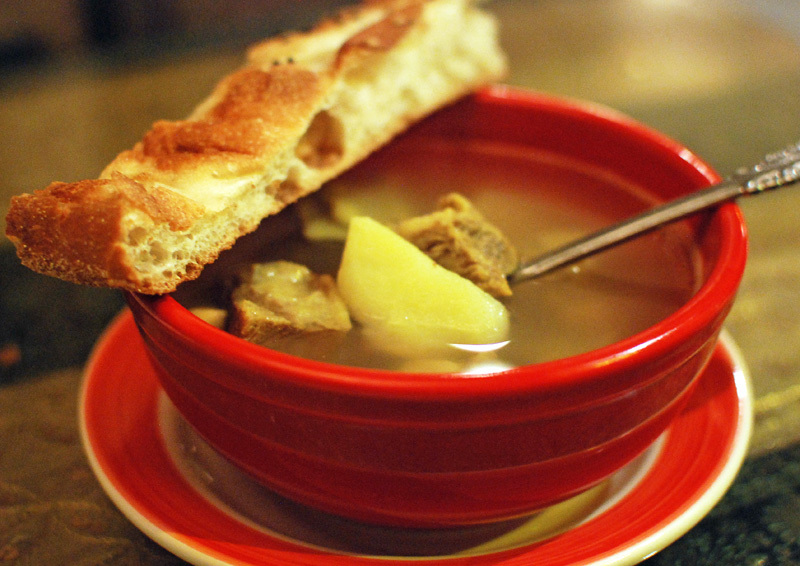 This is also the second Azeri restaurant in New York where I’ve seen foie gras on the menu, for some unknown reason. 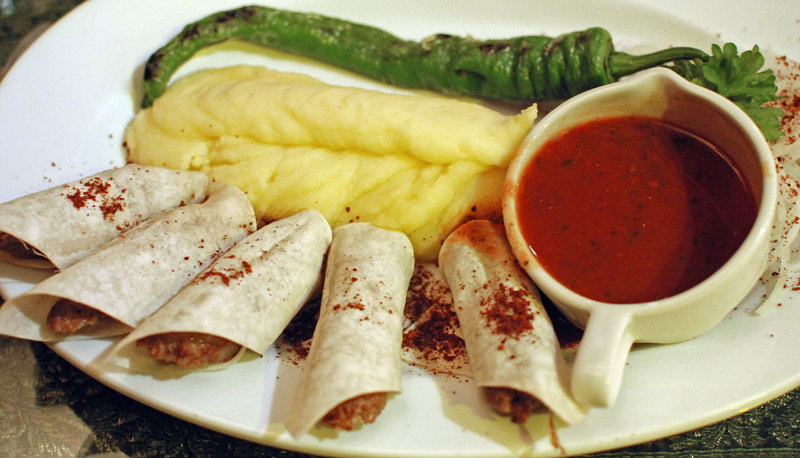 The Azeri appetizers were limited to a few classics. We started with a meat kutab (not photographed), and the Baku-style eggplant, fried slices of eggplant topped with a garlic, walnut and turmeric paste; both were pretty good. The lyulya kebab contained a lot of onion, which had the benefit of moistening the meat, but gave a too-strong onion taste (duh). Making a great lyulya can be much harder than it seems. The other meats were all tender and juicy, and the fries weren’t bad either. Unfortunately, the menu didn’t feature many other Azeri entrées, save for baby lamb tongues and dzhyz-byz (fried lamb offals and potatoes). 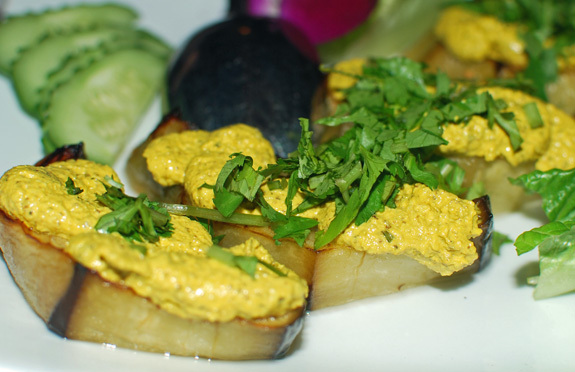 While Manhattanites are rediscovering offals in fancy restaurants, Apsheron had been serving them all along! We might have to come back another time to have an offal-centered meal. 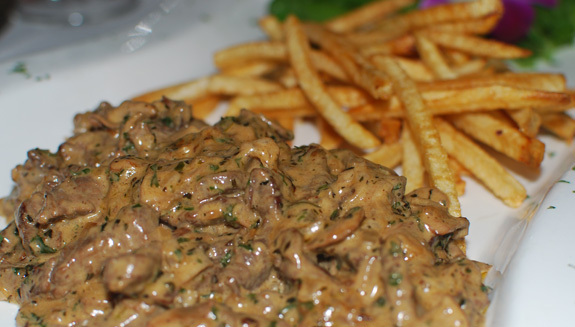 For this time, we decided to give a try to the beef Stroganoff instead, thin strips of beef in a thick, bland mushroom sauce with lots of thyme. It was probably above average — it’s just that the average can be pretty bad. The leftovers sit unclaimed in our fridge. And I finally got my pakhlava! I salute the effort, but personally I would have made thicker, fewer layers with more honey — I like when the pastry sticks to my fingers. For the record, the menu also listed shaker-bura (a sweet baked dumpling) and a couple napoleons. What to do on Black Friday on your way back to New York after a Thanksgiving family gathering? Stop for lunch at a Staten Island restaurant, of course! Chinar on the Island, “finest dining of NY”, “honors the breadth Mediterranean cuisine by bringing fresh, wholesome cooking from almost all regions of Middle East to an elegant, contemporary and comfortable setting [sic]”. However, as they answer phone calls directly in Russian, you may start realizing that this joint isn’t quite Mediterranean, and they don’t really serve Middle-Eastern food either. A glance at the menu reveals this is actually one of a handful of Azeri restaurants in New York — the other ones I’m aware of being Apsheron, Baku Palace and Cafe Sim-Sim. Apparently, the Soviet community has recently boomed in the forgotten borough, and although you won’t feel the same kind of immersion as in Brighton Beach, there’s a local Russian-language newspaper, and a few stores and restaurants. Chinar’s dining room is pleasant and not too kitsch, save for the (uh-hum) fountain and golden trees in the center — “[the] branches are bringing peace and relaxation into today’s stressful life”, we are told. 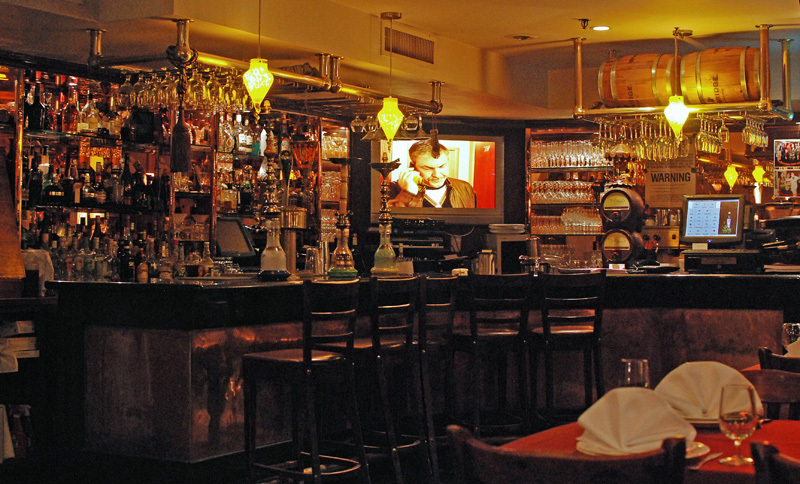 You can check out the pictures on their web site, but looking at my own snapshots of the bar, I now see that not only can you watch the Kremlin’s official programs on Russian Channel 1, you might also be able to smoke the hookah. The menu offers a commendable selection of Azeri dishes, above and beyond the usual shashlyk assortment you find in other places, even in Azerbaijan. The soup was good but slightly lacked complexity. 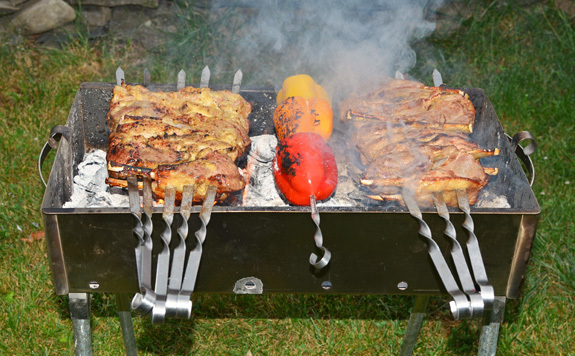 I’ve seen piti recipes where onions, tomatoes, plums and various herbs were also added. The flat bread was everything bread should be: warm, freshly made and fragrant (quick scientific explanation: bread contains lots of starch, and starch “retrogrades” and traps flavor when cooling, which is why bread tastes so much better when it comes straight out of the oven). 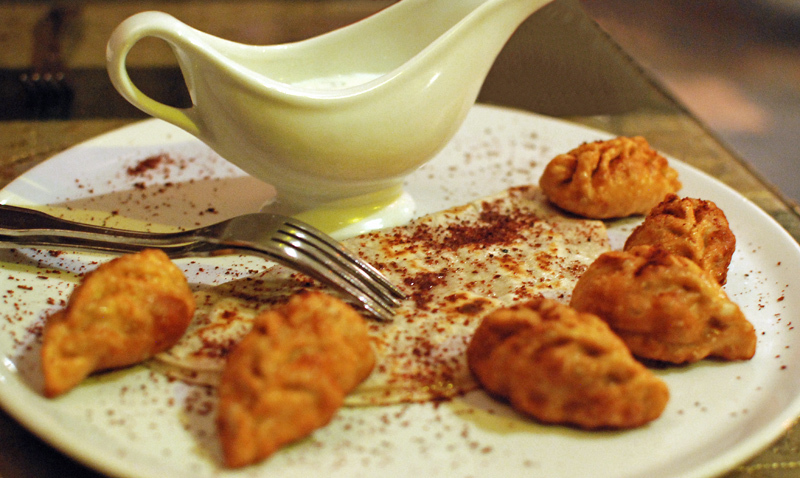 A kutab is a disc of thinly rolled dough, stuffed, folded, then fried. 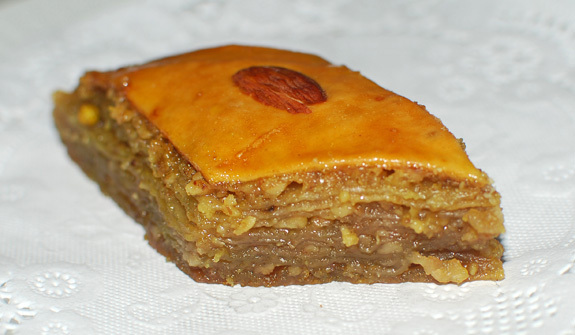 The small amount of filling is traditionally made of lamb, greens or pumpkin. Our meat version was nice and juicy. 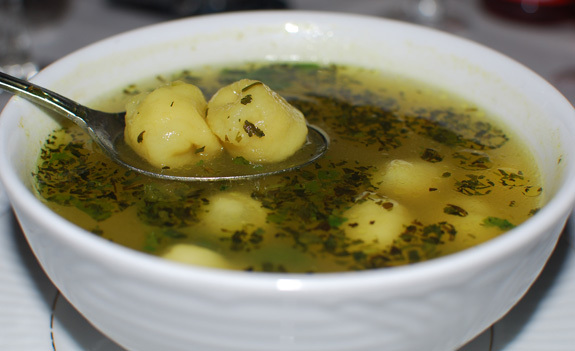 The dumplings, called gyurzas, also contained a delicious lamb mixture. In the recipe I knew, they are simply boiled, but these were boiled then fried. The appetizers were served with katyk (a kind of thick yogurt) mixed with dill. Sumac, the red spice you see on many of the pictures, adds a lemony taste to the dishes. This was fine but a bit disappointing after the appetizers. The meat was too compact and not juicy enough to my taste. The mashed potatoes were nondescript and the ketchup-like sauce unnecessary. I would have been much happier with some narsharab, a pomegranate sauce. 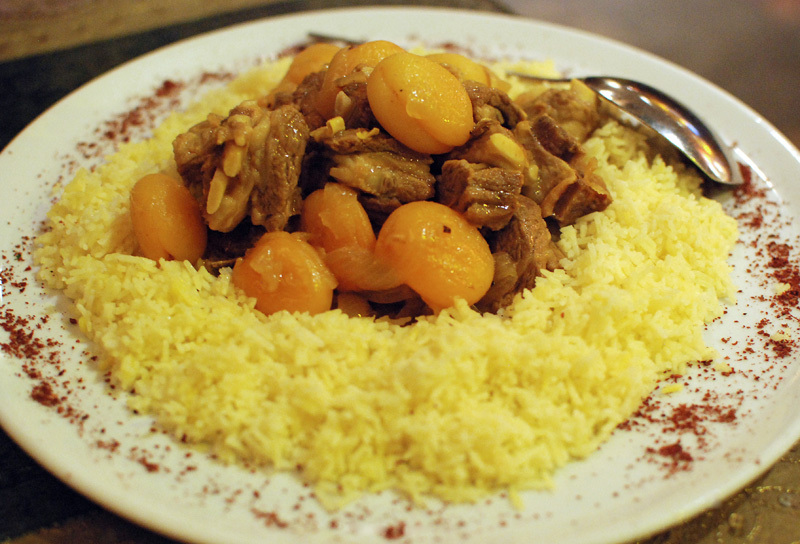 In Azeri plov, unlike its Uzbek counterpart, the rice and the garnish are cooked separately and put together only at service time, yielding a somewhat drier, less greasy dish. 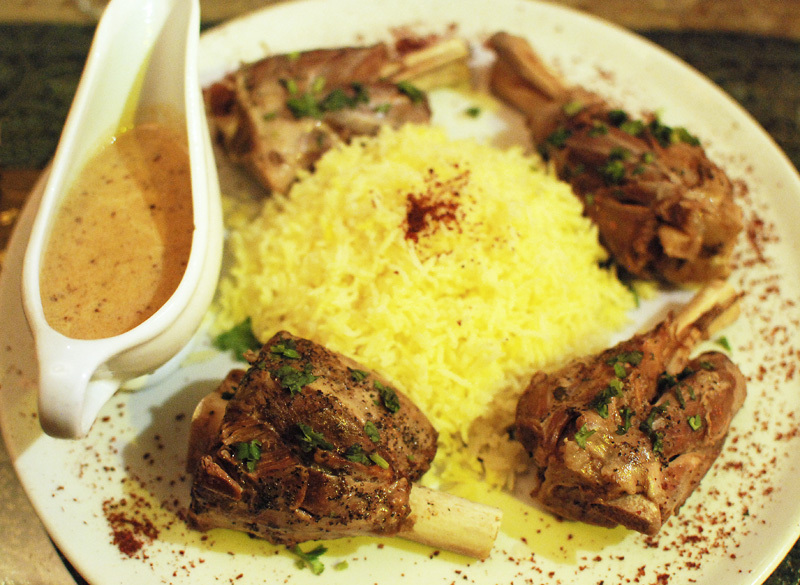 This was pretty good, but the lamb was mostly bones. I find that it makes more sense as a side to eat with shashlyks than as a full-meal dish. In retrospect, I wish we’d tasted more of the kebabs. This is the eternal problem with Azeri cuisine: either you order the shashlyks and you complain you never get to try anything else, or you order other entrées and you miss eating the shashlyks. 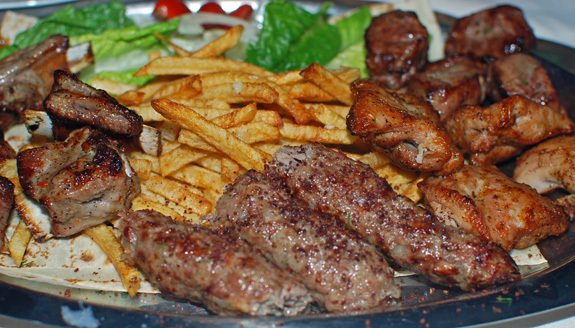 I could totally see myself coming back with friends on some weekend night and trying many of the things we skipped — the kebabs, the quail, the other plovs, the hookah. But then… how are we supposed to get home from Staten Island in the wee hours?? ?